The February month started off with lots of events and movie Premieres before another New York fashion week starts. From the worldwide Premieres of blockbuster “Zoolander 2”, to the ‘Vogue 100 – A Century of Style’ event held in London, Fab Fashion Fix brings the best of recent celebrity red carpet style. The new year started quite busy for Academy Award winner Penelope Cruz as she is doing worldwide promo tour of her new movie ”Zoolander 2”. For the Premiere in Berlin (February 2nd), the 41-year-old mother of two showed off her slim physique in Balmain emerald green mini dress and completed the look with Roger Vivier shoes and Chopard jewelry. For the next red carpet appearance, Penelope shined at the “Zoolander 2” Premiere in London, on 4th February 2016. She pulled off quite daring metallic floor-length Atelier Versace gown with thigh-high split. She was joined her co-stars Ben Stiller, Will Ferrell, Christine Taylor, Kristen Wiig and Owen Wilson. Next came the inevitable New York Premiere of “Zoolander 2”. All eyes were on Penelope as she stepped out in Balmain halterneck column gown with all over golden embellishments and finished off the look with Ara Vartanian jewelry. For beauty she donned her signature smokey eyes and retro waves hairstyle. British model Jourdan Dunn was also at the “Zoolander 2” Premiere in London, on 4th February 2016. The 25-year-old Maybelline ambassador dazzled and showed off her statuesque figure in Ralph & Russo pearl and silver iridescent silk organza bustier dress with geometric cut outs and tender petal appliqué, from their latest Couture spring 2016 collection. She recently teamed up with M&S to launch a new range of childrenswear named Lil’ LonDunn by Jourdan Dunn, the collection celebrates Jourdan’s love of her hometown, London, and has been designed by the model with her six-year-old son, Riley, as the inspiration. American actress Dakota Johnson was all smiles at the ‘Vogue 100 – A Century of Style’ event held in London, February 9, 2016. The 26-year-old star of “Fifty shades of Grey” was dressed in Marc Jacobs golden gown while accessorizing with Charlotte Olympia heels, Anya Hindmarch clutch and Messika jewels. She is currently promoting her new movie “How To Be Single”, which is about New Yorkers who need to learn how to be single in a world filled with ever-evolving definitions of love. Brazilian supermodel Adriana Lima also attended the New York Premiere of “Zoolander 2”, on 9th February 2016. The 34-year-old Victoria’s Secret Angel was an elegant vision in white suit combined with oversized white fur coat and completed the look with a pair of red shoes. Adriana wore her hair in a sleek low ponytail and accessorized simply with a gold choker necklace and studded earrings. British actress Emma Watson was an elegant vision in white at the “Colonia” Premiere in Berlin (5th February 2016). The 25-year-old actress and UN goodwill ambassador for women’s rights was joined by her co-star Daniel Bruhl. She was wearing a Maiyet dress and accessorized with Vita Fede jewelry. 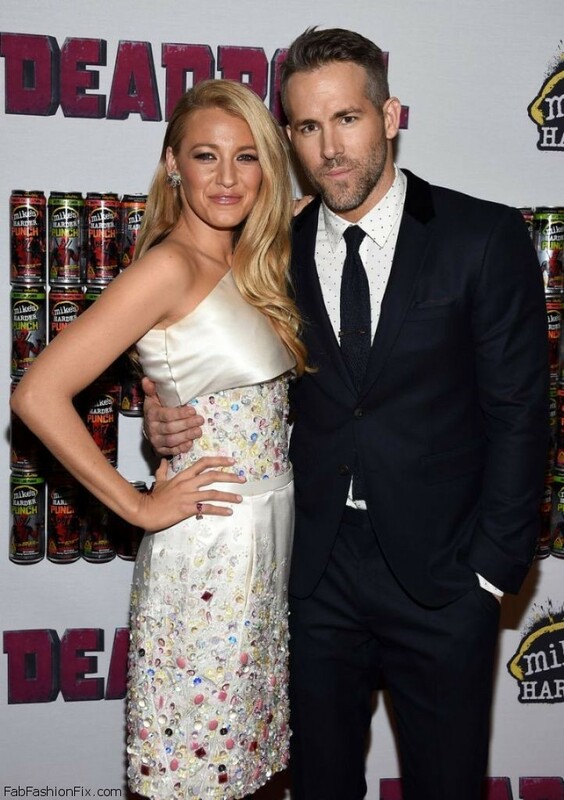 Actor Ryan Reynolds and his wife Blake Lively looked picture perfect at the “Deadpool” Movie Fan Event at AMC Empire Theatre, in New York City on 8th February 2016. The 39-year-old actor looked handsome in Burberry suit, while 28-year-old Blake opted for classic elegance with Chanel Couture one shoulder beige dress with colourful rhinestone embellishments and finished off the look with Stuart Weitzman sandals. Victoria’s Secret Angels Elsa Hosk and Jasmine Tookes were all smiles while posing for photographs at the Victoria’s Secret Valentine’s Day Collection Launch held in New York City (February 9th). The 27-year-old Elsa looked pretty in Dior red silk mini dress and completed the look with Balmain shoes. The 25-year-old Jasmine opted for chic and elegant look in red dress designed by Australian fashion label Nicholas. In case you have missed it see the whole Victoria’s Secret 2016 Valentine’s Day Collection.